Win a hamper of exclusive Dumbo merchandise from Disney! Disney’s new live-action movie Dumbo opens in cinemas across South Africa today. Did you read my review of the movie yet? To celebrate I have an awesome hamper of exclusive Dumbo merchandise to giveaway to one very lucky winner! 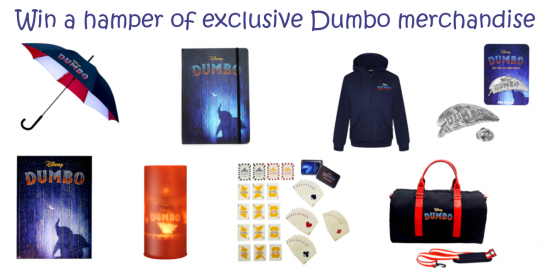 The hamper will include a Dumbo hoodie, LED candlelight, notebook, pin badge, playing cards, puzzle, travel bag and umbrella. The winner will be the talk of the town, not to mention the most popular parent in the house for at least a week, guaranteed! Get your entry in today by filling in the form below. To be eligible to win you must have liked the Forts and Fairies Facebook page and you must also follow Forts and Fairies on Instagram. Only entries from South Africa will be eligible to win. One entry per person please. Competition closes on 12 April 2019. Terms and conditions apply. Win a copy of Dinosaur Roar! Win 1 of 5 copies of Thor: Ragnarok on DVD!